People check currency exchange rates at a currency exchange office in Istanbul, Turkey, Aug. 10, 2018. The White House issued a proclamation Friday evening officially announcing the doubling of steel tariffs on Turkey, slated to go into effect Monday. Earlier Friday, the Turkish lira suffered its worst one-day loss in a decade after President Donald Trump announced the United States would hike metals tariffs, prompting investor confidence to slump. Trump announced the doubling of aluminum and steel tariffs in a tweet Friday morning, citing bilateral strains. Ties between the countries have been strained, as Washington is urging Ankara to release Andrew Brunson. The American pastor is currently held under house arrest on terrorism charges. The White House dismisses the charges as baseless and accused Ankara of hostage taking. Turkey wants Brunson to stand trial. The Brunson dispute triggered the collapse in the Turkish currency as investors feared U.S. financial sanctions. All week the lira has been under pressure, which accelerated with the failure of diplomatic talks in Washington this week. U.S. patience with Turkey is seen to have ended, experts say. “Most of the actors in the Washington scene think that carrots just don’t work with Turkey, just the stick,” said political analyst Atilla Yesilada of Global Source Partners. Turkish President Recep Tayyip Erdogan addresses his supporters in Bayburt, Turkey, Aug. 10, 2018. Friday saw the lira falling more than 15 percent, bringing the decline to more than 40 percent since the beginning of the year. 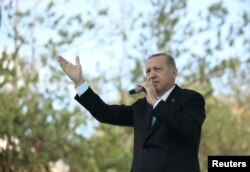 Turkish President Recep Tayyip Erdogan addressed supporters in the provincial city of Bayburt. The Turkish president alleged Western powers are seeking to oust him from power through the creation of a financial crisis, after failing to so during a 2016 coup attempt. Analysts suggest Erdogan could have Washington in mind, given Ankara is demanding the extradition of U.S.-based Turkish cleric Fethullah Gulen, who is blamed for masterminding the botched 2016 military take over. Erdogan’s claim of a Western political plot against him sparked alarm in investors and prompted an acceleration in the currency sell-off. Ankara is under pressure to adopt orthodox steps to protect the lira by aggressively increasing interest rates to rein in double-digit inflation, a move Erdogan has publicly opposed. Adding to investors’ concerns, Erdogan pledged a continuation of his debt-fueled construction policy to boost the economy, which is blamed for Turkey’s rampant inflation and has added to currency weakness. A Turkish man waits to change his U.S. dollars with Turkish liras inside a currency exchange shop in Ankara, Aug. 10, 2018. 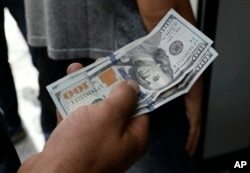 A financial shockwave ripped through Turkey on Friday as its currency nosedived on concerns about its economic policies and a dispute with the U.S., which President Donald Trump stoked further with a promise to double tariffs on the NATO ally. The Turkish president Friday dismissed such concerns and called for people to defend the currency. “Those who have dollars, euros or gold under their pillows should go and exchange them into (Turkish) lira. This is a national struggle. This will be my nation’s response to those who have declared an economic war,” Erdogan said during a rally of supporters. The drop in the lira has put increasing pressure on Turkish banks, given that many companies have borrowed heavily in foreign currency. Corporate foreign currency loans are around $250 billion, much of which is due to be repaid in a year. The Turkish president his indicated possible support from Beijing and Moscow, but analysts are skeptical given the scale of support the Turkish economy needs. But the souring in U.S.-Turkey relations could give new strength to Russia-Turkey ties, already a source of concern among Turkey’s Western allies.